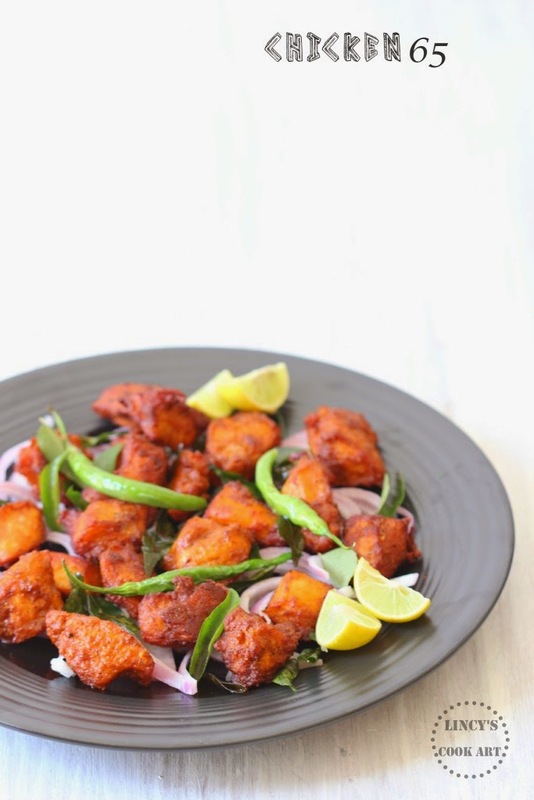 Chicken 65 is a popular appetizer or starter of South India. There are many controversies regarding the name reason for this particular dish. Because it is a unique name with numbers. I believe the story, the popular restaurant in Chennai 'The Buhari' invented this popular dish and it was introduced in the year 1965. So the 65 came from the year. They also offer Chicken 78, Chicken 82 and Chicken 90, introduced in 1978, 1982 and 1990 respectively. Some says this dish must be prepared using 65 days old chicken, like so many stories are there. I do not believe in them. This is an easy to make tasty dish liked by kids to adults with out any age difference. Once you make this dish this will be finished in no time. When you fry this chicken even you get tempted to eat this. Cant resist the taste!!! In a deep bowl add the chicken pieces and add the all the other ingredients such as all purpose flour, corn flour, ginger galic paste, chilli powder, pepper powder, garam masala powder, fennel powder, salt, lemon juice, a teaspoon of oil and also food colour. Add two teaspoons of beaten egg and mix well with the chicken as a mixtutre. Add baking powder initially in the marinade if you like to get this crispness last for hours like restaurants. Keep the marinated chicken for 15 to 30 minutes to absorb the masala inside the meat. Heat oil in a pan and reduce the flame and fry the chicken on low to medium flame till crispy. Add some curry leaves and just before taking the chicken and fry with them and drian the chicken from the oil with the fried curry leaves using a slotted spoon. Fry them in two batches. Serve with onion and lemon wedges. Could be served as a starter or side dish for rice with rasam or chicken curry. Note: For variation add a teaspoon of soya sauce and tomato ketchup in the batter and follow the same procedure and deep fry the chicken. You might also like Broccoli 65 recipe which is a vegetarian healthy version which i have posted earlier. can I grab that plate??? The perfect starter!!! Looks so delicious! !